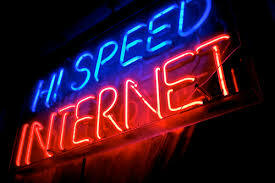 High speed internet has become indispensable for many people and businesses. High speed internet covers most of Prince Edward County, but the speed and reliability depend on the location. Buyers who depend on high speed internet should confirm that it is available before making an offer on a property. The built-up areas including Picton, Bloomfield and Wellington offer the best options for speed and availability. Bell, Cogeco and EastLink provide cable-based services in these areas. Depending on the provider and price plan, speeds up to 100 Mbps are available. Broadband is avaialble in most rural areas but the providers are different and the speeds are not as high. KOS (Kingston Online Services) and Xplornet both provide internet in Prince Edward County over the airwaves from a series of towers. These providers advertise speeds up to 25 Mbps in rural areas, but the speeds actually delivered are in the 1-6 Mbps range. These services can slow down during peak usage periods like right after school, especially on towers that are serving a large number of users. In addition, outages are not unheard of and call wait times for customer service can be long. Until recently, KOS and xPlorenet were the only options for internet in Prince Edward County’s rural areas. However, cellular data services are becoming a viable choice. Bell, Rogers and Telus historically offered high prices and limited speeds with their cellular based plans. Speeds have improved significantly while prices have fallen too. In areas where coverage is good, these cellular based services can now acheive speeds of 60 Mbps or greater. However, speed depends on location. Each of the cell phone companies has areas in the County where coverage is good and other areas where coverage is weak to non-existant. With both types of rural high speed, the speed can vary dramatically with location, differing even from house to house. High speed internet in Prince Edward County has come a long ways, but it’s a good idea to check of the coverage before making an offer on a property.